Here’s the poster for our celebration: Tony Poster – Oct 24 2011. Feel free to print it and post it around your neighbourhood. We’ll also be collecting donations for a permanent memorial: A park bench and commemorative plaque, to be installed near Tony’s regular spot. 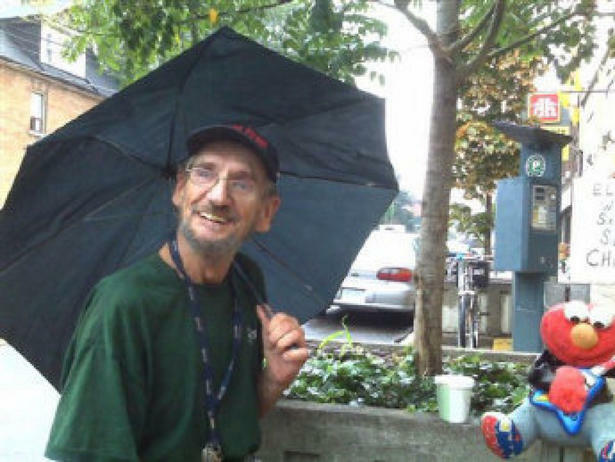 This entry was posted on	October 21, 2011 at 1:25 pm	and is filed under homelessness. Many of the Zen Centre crowd will be in retreat that day, so we won’t be able to be there for the memorial. However, please know we’ll be there in spirit. This morning we toasted Tony with our coffees. Roncy just isn’t the same without him. my daily walk will never be the the same! Toni say hi to mommy! for me! love NJ! I am in sympathy with the celebration of Tony’s life, and the memorials, etc. etc. etc. but I have yet to find anyone who knows anything about where his body lies at rest, and what preparations are being made for funeral. Tony was more than an icon. He was a human being. As such he still has ‘material needs’. Isn’t anyone interested at all in Tony’s post-partum treatment? Doesn’t anyone know where and how the body of Tony, the human body, is doing? Thanks. I feel most relieved to know that the family is involved. I was quite concerned. I’ve been thinking about making a little shrine for Tony for the Night of Dread celebration in Dufferin Grove park, it includes a little memorial garden. Would it be okay to bring this along to the memorial on Monday eve. Others could add bits and pieces to if they like. unfortunately my partner and I will be in Montreal for the week but with you all in spirit. will the event be video’d and posted for those of us out-of-town? will there be another opportunity to contribute to the bench fund? i work as an architectural consultant and have a colleague who is currently designing a singular public bench for the City of Hamilton. i can tell you that the City’s requirements for the specification of the bench (dimensions, clearances, etc) and its relationship to other infrastructure is extremely complex. the CoT has a program on commemorative benches and trees linked below. as you will note, the costs are substantial to go it ‘by the book’. perhaps there is a contact involved w/ this program that could shed some insight? 1 – the new paving stones along Tony’s spot are removable; could we have one pulled-up, engraved with his name and the dates of his life and re-installed? 2 – could the placard Tony had with him everyday “Can you spare some change…God bless” be bronzed or replicated ina permanent material w/ his name and dates of his life inscribed on the backside and placed in one of the flower beds or the like? i won’t be able to attend Monday’s gathering due to work commitments, but can be reached at the e-mail address below to assist w/ the logistics of the bench (i’d also like to contribute monies), or helping w/ any alternate memorial ideas (those suggested or otherwise). Thanks sharonclemens. I missed it in the star, didn’t think to look at the obituary section. Would you be so kind as to ‘copy’ what was said if that is the case. Are we to presume that he is being buried, (or cremated?) today? Where has his body been held? – the city morgue or a funeral parlor. I would assume the former, and thus the celebration at Alternatives. Quite an alternative. Well I made a mistake on my last entry, thinking of death as a ‘rebirth’, but perhaps I should have said: we need more news on TONY, his post-part-US!. Thank you. On second thought, I think I’ll take another walk to the corner and see if there are still copies of the Star there. Good news. I found the obituary. But that’s not the good news. The obituary is. See next post. Peacefully, in Toronto on Tuesday, October 18, 2011. Beloved husband of the late Sharon. Loving father, grandfather, brother, uncle, cousin and friend to all. Friends may call at the Turner & Porter Funeral Home, 436 Roncesvalles Ave. Toronto (at Howard Park Ave), from 6-9 p.m. on Tuesday. Funeral Mass will be held at St. Vincent de Paul Church, 263 Roncesvalles Ave. Toronto, on Wednesday, October 26, 2011 at ll o’clock.